Lighting can change the mood of almost any occasion. From portraying the weather or creating a dramatic setting in a theatre production, to lighting a stage and creating dynamic visual effects for a concert, BEW has a number of different options to accommodate specific needs and budgets. Our extensive knowledge on the leading manufacturers’ newest products helps you make the important choices that can take your event to the next level. 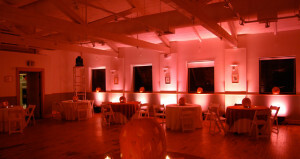 Contact us today to see what lighting solutions we can provide for your next event. 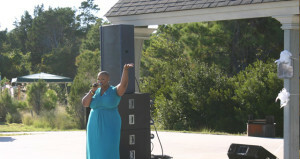 Stages are needed for all sorts of events and can really set your event apart from the rest. Imagine being fifty feet back in the audience, everyone standing and there being no stage for the band to play on. You might catch a glimpse of the artists’ heads through the crowd as they dance but thats about all you will see. 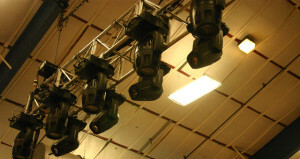 Because of the constant demand, BEW is constantly improving on our staging departments’ resources and options. There are several staging approaches we rely on to handle various situations, whether it involves bringing in an automated tractor trailer stage to satisfy limited load in or load out times to flexible understructure systems that can be built on rough and unleveled terrain where trailer stages can’t be set up. Another concern with staging work that has come up recently is safety for performers, crew and audience members. After the number of staging accidents that had been occurring, BEW took a break from a lot of temporary structure work and spent a good deal of time reworking our approaches to stages. Today, a lot of events are overseen by local building inspectors that don’t differentiate between temporary and permanent structures and ensure structures are built to meet various codes. We currently work with engineering firms nationwide to ensure our new stage designs are up to code and safe. Contact us today to find out more about our stock and custom staging solutions. Rigging is a necessity for many events and can be used for a variety of purposes. Properly executed rigging can allow for cleaner sight lines for audience members by getting lighting, sound and video equipment up higher while also providing optimal positioning for gear. Different situations and venues require different approaches such as rigging off of the existing framework of a venue or ground supporting loads using scaffold or tower systems outdoors or where building steel isn’t accessible or ample. Rigging solutions from BEW can also be used to create aesthetic aspects for an event or provide a place to rig advertisement banners. Contact us today to see where BEW’s rigging department can help you. Special events often require a large amount of power. Lighting, sound, video and rigging equipment can all draw large amounts of power or require special types of power to run. While some venues have the means to meet these requirements, it isn’t always as simple as running an extension cord to the wall. BEW specializes in power distribution systems that can tap off of building service lines through a breaker panel or can be fed by a mobile diesel powered generator. By running high current feed lines to a temporary distribution panel provided from BEW, we are able to route power more efficiently to where it is needed and provide the ample clean power needed by equipment. 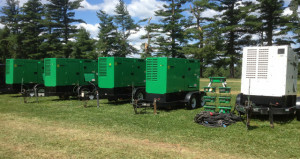 Diesel generators can also be implemented as backup power systems for events. BEW can deploy a generator and have it standing by to take over powering an events production should there be an outage for any reason, and minimize down time to a matter of minutes. Call us today to see how we can power your next event.